The Enterprise is incapacitated by an ancient but incredibly sophisticated computer virus while in the Romulan Neutral Zone. I don't agree with Picard's logic for sticking around in the Neutral Zone until Geordi can trace and fix the supposed design flaw. Granted, the flaw, if it actually existed, could cause the destruction of the Enterprise, but given that they've been out in space for a year and a half without any indication of it, it would seem that the giant Romulan vessel combined with the Enterprise's provocative presence in the Neutral Zone is the more immediate threat. Surely they could quickly hop back over the border into Federation space and then give Geordi time to work. The Iconian probe is really cool-looking, unlike anything we've seen on Star Trek up to this point. It's weird and wild, and it kinda reminds me of Descent. "We would appear magical to Stone Age people." There's Clarke's Third Law again. La Forge being thrown around in the turbolift sounds cool on paper, but on screen, it just looks like an actor throwing himself against the wall while grunting and making stupid faces. Picard could have argued that it would actually be safer leading the away team than staying on board as a way to answer Riker's predictable captains-don't-lead-away-teams-into-dangerous-situations complaint. Troi is squeezing Riker's hand when they think they're about to be blown up by the Romulans. I like that it's kept relatively subtle. There's some logistical complications about the gateways that aren't addressed. 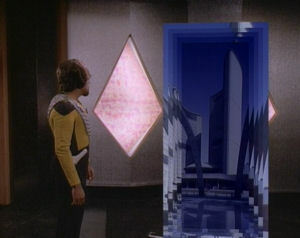 For example, the atmospheres, pressures, and temperatures of the various places are all bound to be different, which would cause problems in the small chamber where Data, Picard, and Worf are standing. It's confusing, though, because on one hand, the gateways appear to be one-way (people on the other side can't see it, and once the members of the away team go through it, they can't go back), but on the other, we see Data stick his hand through and then pull it back. If the gateway is truly one-way, then that would create a sort of vacuum, sucking all the air out of the room. They do say over and over again that the Iconians possessed crazy advanced technology, so I guess they had ways of working through these problems. I love how the solution is to shut down the computer and restore it to an earlier state. When the room explodes, how come the explosion doesn't go through the gateway? Perhaps the gateway shut off as a result of the destruction, just in time. Good thing, too, because that could have been a serious problem for the bridge of either vessel. We finally hear Picard order "Tea. Earl Grey. Hot." It's weird that such a memorable catch-phrase takes so long to make its first appearance. We'll see the Iconian gateway technology again, but it won't be until pretty far into DS9.